"Step right up to the greatest party in East Texas!" 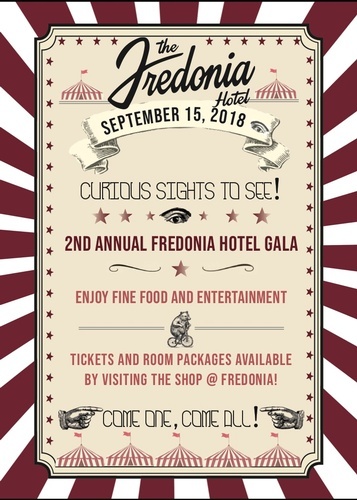 The historic Fredonia Hotel is hosting its Second Annual Gala on Saturday, September 15th from 7pm to 11pm. Attendees are sure to be mystified and entranced with the décor, food, and entertainment! Guests will feel like a kid again as they join the hotel ?Under the Big Top? for this circus themed event. The Gala will feature unique acts provided by Aqua Acro Entertainment from San Antonio, TX. The evening will also feature stilt walkers, a fortune teller, and many other surprises! Aqua Acro?s aerialist performers will leave guests so amazed it will be hard for them to look away as the performers push the boundaries of both strength and flexibility with grace and ease. The festivities will begin with a cocktail hour in the Banita Ballroom starting at 7pm, which will feature classic circus hors d?oeuvres with a gourmet twist. After the cocktail hour, guests will be moved to the Convention Center for the main attraction. There they will be treated to a plated meal unlike anything ever seen in East Texas! The dinner is sure to dazzle and delight. After dinner, guests that are still hungry can treat themselves to the dessert bar offering even more unique circus delicacies. If the food, environment, and unique entertainment aren?t enough, guests can dance the night away with music provided by DJ RLE of Austin. DJ RLE, also known as Raymond Cruz, is a Nacogdoches native who has been refining his craft in Austin and is one of the best DJ?s around. The music selections for the evening are sure to get anyone up and dancing! As part of the special event, The Fredonia is offering special room rates and packages. For one night only, rooms in the Tower section of the hotel are going for $99, rather than the regular price of $149 per night. These rooms are the perfect spot to unwind after a long night of celebrating and dancing. This year?s gala is being held to commemorate the one-year anniversary since the grand re-opening of the Fredonia after an extensive renovation by owners, Barbara and Richard Dewitt. The Dewitts and the entire hotel staff are looking forward their anniversary with the community! Tickets and room packages are available by visiting the Shop @ Fredonia, www.thefredonia.com, or by calling 936-564-1234.? Tickets and room packages are available by visiting the Shop @ Fredonia, www.thefredonia.com, or by calling 936-564-1234.